Like all bull markets, the silver bull market has different phases, and theses phases have different intensities of price growth. There are various indications/signs that silver is going into a phase of the bull market where prices will rise much faster than before. I have covered some of them in previous articles. Here are a few things to look at. Due to the special relationship that silver prices have with the USD/ZAR exchange rate, it is good to watch it for an early sign of a shifting bull market. I have highlighted three significant peaks of the USD/ZAR chart. These were formed roughly seven years apart. This ratio tends to spike significantly before major market events or turnarounds. 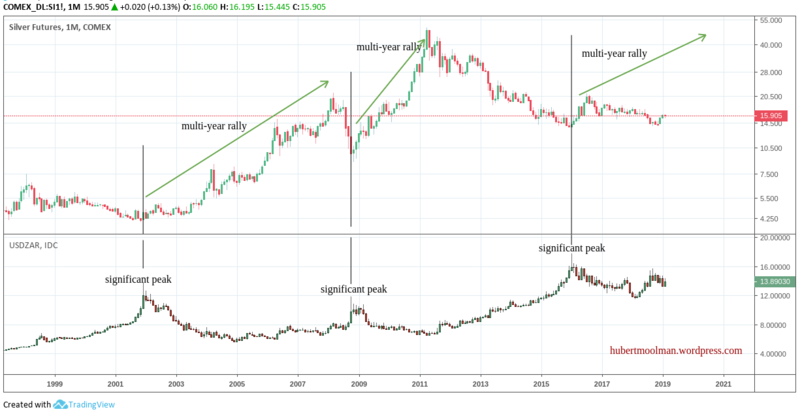 After each of the first two significant peaks (2001 and 2008), a multi-year silver rally followed. The peak of 2016 is more similar to 2001 peak, since, for example, the 2008 peak did not make a higher high. For this reason a comparison to the 2001 peak is more relevant here. Currently, silver prices are higher than the level it was at the last USD/ZAR peak, but it has not really taken of yet. The probability that it will rise faster over the coming months and years are really high. 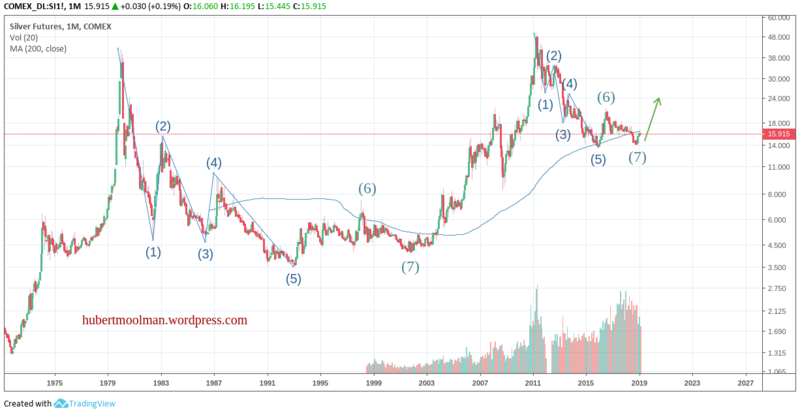 Especially since if you look at the silver rally after the 2001 USD/ZAR peak, you will see that silver did not really take off until the middle of 2003. Now, we have to look for the USD/ZAR to go down another level (probably below the 12-level) to set off the acceleration of silver prices. Note that the USD/ZAR chart is often a leading indicator for silver prices, so it is likely that we will see a drop in the USD/ZAR rate before a silver spike, however; it is not impossible that silver spike at the same time as a USD/ZAR drop or even before. The silver correction since 2011 appears to be forming a similar pattern to the one from 1980 to 2001. I have marked the two patterns (1 to 7) to show how they could be similar. The move from 1 to 5 is typical of a major correction (from top to bottom). If the comparison is correct, then we appear just past the bottom for silver (a secondary bottom, since point 5 was the lowest). Silver now needs to cross the 200-month moving average to confirm this bullish comparison.